Take the edge off your tone with this musical underdrive. 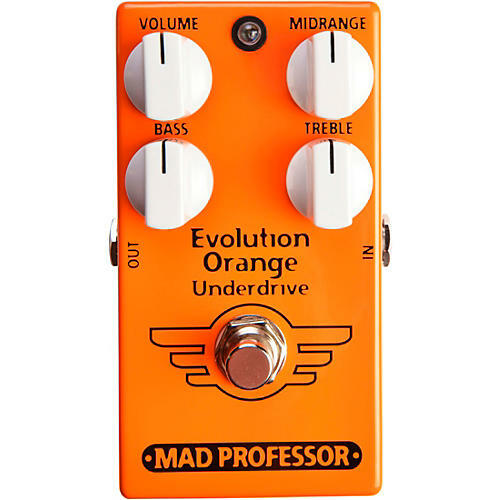 The Mad Professor Evolution Orange Underdrive (EOU) offers a new way to approach your tone. Instead of overdriving your clean tone, now you can get cleaner tones from your favorite overdriven tone. That is what the designers call underdriving. Evolution Orange Underdrive works really well with vintage single channel amps that sound great when you push them to overdrive. When you turn down the volume from your guitar to clean that tone, the sound often gets a bit too dark and the clean tones are not as good as the overdriven tone. With EOU you can tailor your cleaner tone with the four pots. The Evolution Orange Underdrive works by lowering the midrange as that is where the overdrive mostly is. You can dampen the amplifier input with the EOU’s Volume control and then set the Bass and Treble to tailor your clean tone. EOU can also be used to boost mids by settings the Midrange and Volume up.